Here are some of the most visually outstanding and thought-provoking animated films that will help you #adult. Animated films have a rep for being for kids or family only, because they’re basically cartoons—fluff we indulged in when we were little. But animated films usually have their captivating art, their catchy and meaningful songs, and some life lessons for us. They also burst with adventure and sweep us for a joyride, or let us bask in the beauty of a moment before it ends. One of the great things about animated films is that it can take us back to our childhood imaginations—or to a setting we’ve never imagined—while revealing or reminding us that there’s something good about ourselves or the world. That said, animated films aren’t just for kids who have their whole lives ahead of them. They’re also for us when we’ve lost our way. Below are some of the most visually outstanding and even thought-provoking animated films that will help you brave the complicated and exhausting adult life. The film follows the 10-year-old Chihiro who must rescue her parents from the spirit world, since they are turned into pigs and held captive. It’s a daunting task, made all the more so by powerful creatures, many of which are just as greedy as they are monstrous. But Chihiro makes some friends; and with their help she finds the strength to save her family. 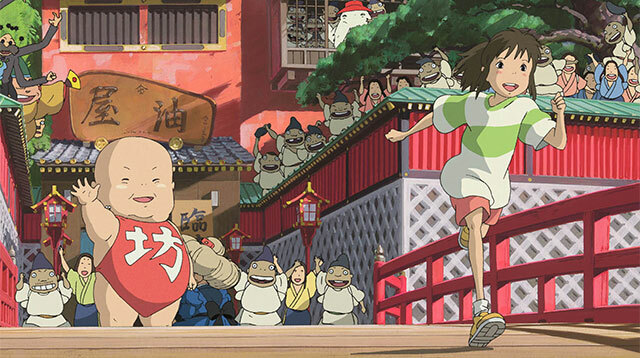 Critics agree that Spirited Away, directed by Hayao Miyazaki, is one of the best animated films of all time. It’s a captivating adventure story that speaks of the importance of kindness and love, and how in a place where there seems to be no kindness or love, you might need to give the place a chance. Or you can show kindness and love yourself. The film’s protagonist Anna considers herself an outsider. She was given up to foster care when she was a baby, leading her to believe she was always unwanted. She has blue eyes but doesn’t know why (since she doesn’t know who her real family is), making her a bit of an oddball in Japanese society, too. When she comes across a mansion by the marshes, she meets a mysterious girl named Marnie. Anna and Marnie become friends (with undertones of innocent romance), and soon enough Anna no longer feels alone. When Marnie Was There will leave you crying as it shows you the value of family and friends—how both make life worth living. Featuring characters from Irish folklore like the selkie, the faerie, and the Celtic goddess Macha, Song of the Sea does more than revive Irish folktales. Underneath the action and the exquisite 2-D artwork is a story of grief. A 4-year-old named Ben is excited for the birth of his little sister Saoirse, and his mom believes he’ll be the best big brother in the world. But the following morning, Ben doesn’t see his mother and sees his dad mournfully cradling the newborn baby. Ben resents Saoirse, blaming her for the death of their mom. Meanwhile Ben’s father drinks his sorrows away, hence failing to take care of his children. Some of the film’s characters drown in their grief, while some repress it. But Song of the Sea deftly consoles them all. When you watch this film, you’ll learn how to overcome the feeling of loss, even if the one you've lost isn’t a family member. This wordless film is about a man who builds a raft to sail away from a deserted island, but a giant turtle destroys his raft each time he goes offshore. Stuck on the island, the man learns to make do of circumstances and builds his life there. The Red Turtle may not have spoken words, but its story, images, and music all together ask difficult questions about when a person has to give up his dreams and take up a new one, when he has to keep persevering or finally go with the flow. This autobiographical film based on a graphic novel tells the story of artist Marjane Satrapi. She’s an Iranian girl who comes of age in a highly religious and tumultuous political environment (the Iranian Revolution). Thinking of her safety because she’s an outspoken young lady, Marjane’s parents send her to Europe. But Marjane soon finds herself out of place and discriminated on, and she becomes homesick for her motherland. She flies back to Iran years later even if it means putting her veil back on and living in a tyrannical society. But she finds that her home has changed, making her homesick for a place that no longer exists. Her family, too, finds that Marjane herself has changed. She then has to reconcile the person she once was with the person she’s become, and find a way to balance the good values of her country and that of the West. While Persepolis is deeply personal, you can still relate to Marjane. We didn’t choose our backgrounds, we all grow up, society has its standards for women, and we learn to live with everything and break the rules when we can. Who we are is shaped by all those things, and we have to know when to go with the flow and when to stand our ground. It’s a balancing act: we become better at as we grow older. This fantasy film tells the story of Sophie, an 18-year-old girl who thinks she’s ugly. One day Sophie is literally swept off her feet by a charming and mysterious wizard named Howl, and a jealous witch turns Sophie into a 90-year-old woman. She leaves her home to find someone who can break the curse and she winds up in Howl’s moving castle, where she meets a demon and an apprentice, and later Howl himself. In spite of or because of her age, Sophie is able to stand up for herself and make herself useful in the caste. As Sophie and Howl become closer, she learns more about his nature and finds herself protecting him from a war that endangers him and her world. Howl’s Moving Castle not only shows the positive things about growing old, like being able to speak one’s mind without worry. It also shows that an old woman can be a hero and can be attractive too. Strength and beauty come in many forms, and those include being nurturing, kind, compassionate, and selfless. Becoming an old woman doesn’t mean you’ll become an evil witch. As the film shows, every character always has a choice to do good and to love. The film follows a single 27-year-old career woman named Taeko, who takes a break from her office job to go to the countryside to learn more about farming. Throughout the course of her trip, Taeko reminisces about her childhood. As she recalls her first crush; her dreams and ambitions; and her struggles with school, she wonders if her younger self would be happy with the choices she’s made. Only Yesterday captures the quickness of life and the depth of a person’s past, and makes a statement that we can steer our lives to the kind we once wanted, even when it seems too late. The Little Prince intersperses Antoine de Saint-Exupery’s beloved classic book with the story of a little girl who has her whole future calculated and planned by her mom. One day the little girl meets an old aviator, who shares with her the story of the Little Prince, and she becomes interested and curious for more. But she is torn between responsibilities forced upon her and her newfound desire to play and enjoy life. A part of her dreads adulthood and how it will change her, but she has no choice but to go through it because that’s part of life. As the aviator says, growing up isn’t the problem; it’s forgetting how to be like a child. Similar to the book The Little Prince, the movie is a sight to behold with its stunning use of stop-motion puppets from paper. It still carries with it some of the insights from the book, but has added a few more for the spectator. A bamboo cutter named Sanuki finds a palm-sized girl in a glinting stalk of bamboo. He takes the girl to his wife, and they find that the “princess” grows at a rapid pace, which earns her the nickname Little Bamboo. Sanuki believes that Little Bamboo is a princess and a divine gift, so he strives for a move to the city, where a mansion and a group of servants eventually wait for them. Little Bamboo is at first thrilled by the new environment, but not for long. When she is trained to be a proper noblewoman or princess, she feels trapped. When she discovers how crude and easily corruptible people can be, she pleads to be taken away from it all. The film’s hand-drawn, watercolor style reflects the gentle and fierce heart of its protagonist, and the flurry of emotions it will make you feel will push you to your breaking point and leave you thinking that life is beautiful.